The staff and long-term volunteers of the Chisholme Institute form an intentional community. This is a planned residential community designed to have a high degree of social cohesion and teamwork. We work together to support the aims of the Institute. Yet as students, we all live, work and practice together to explore our understanding of existence as a single unity. Positions are residential and include full board and lodgings. You may also receive a subsistence payment to help you financially. You will have the opportunity to join in study and retreat courses and daily meditation as you wish. People with all kinds of skills are appreciated and can find a place at Chisholme. Do you love food and cooking and enjoy working with people? 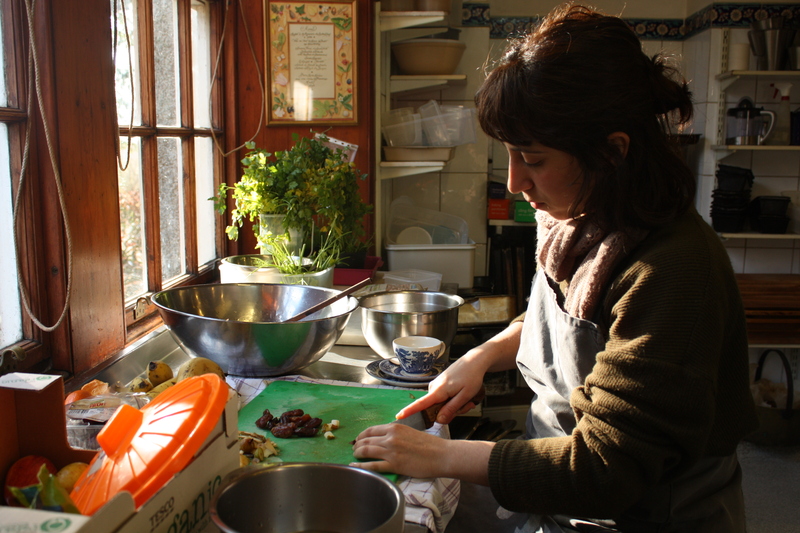 The Chisholme Kitchen is a wonderful place full of warmth and creativity, and it wants you! We bake bread every day, use our own vegetables and salads from the organic garden and meat from a local farm. Experience is very welcome, but training can be given. A gardener or aspiring gardener is needed to look after the organic vegetable garden. It is a walled garden with three polytunnels, with a huge potential for growing many different things edible, and or beautiful, for the kitchen and the house. Experience would be good but not essential, and much help and advice is available. Taking care of old buildings – the main house is over 250 years old – is a varied and interesting job, and not without its challenges. Experience welcome, and also much help and support available. Maybe the most important aspect of this job is to enjoy meeting new people and be warm and welcoming to all who visit Chisholme. In practice, this means you need to be aware of visitors and volunteers as they come and go, and allocate and prepare rooms and look after the laundry. Most of the cleaning is done as a joint effort once a week – your job here is to organize the work and assist and instruct people who are new to Chisholme. Prior experience is welcome but not essential. Do you enjoy interacting with people face-to-face, on the phone or via email? Needless to say you will also need IT and administrative skills to take care of correspondence and bookings, keep the database up to date, do filing and generally keep order. Help and tuition is available. Help is needed with timber extraction, log-splitting, brushing and other forest-related jobs. You will need to be physically fit and enjoy working out of doors in all weather. Experience welcome but not essential.